Build robust database-centric PL/SQL applications quickly and effectively. 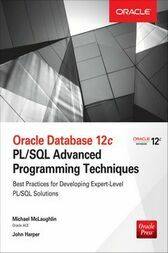 Oracle Database 12c PL/SQL Advanced Programming Techniques shows you how to write and deploy Java libraries inside Oracle Database 12c, use the utl_file and DBMS_SCHEDULER packages, and create external tables and external procedures. Application security, performance tuning, and Oracle Database In-Memory are also covered in this Oracle Press guide.